EXCLUSIVE! For collectors of Nativity sets and those who prize the beautiful, unusual, and rare. 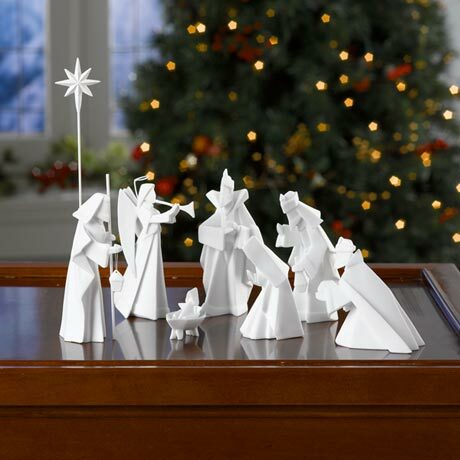 From prayerful Mary to watchful Joseph, the Three Kings, the Angel, and Baby Jesus in the manger, the white porcelain figures look like origami. 9-piece set also includes a star on a stand. Largest figure is 4½"h. 5-piece animal set (HP1642, sold separately) includes Sheep, Donkey, Camel and Palm Tree.